The now well-documented attack by the Black Israelites, ... and “professional Indian” Nathan Phillips upon a group of prolife Catholic school boys from Covington Kentucky at the 2019 March for Life has proven to be an epiphany for many Catholics. Although recent high-profile attacks on Catholic Trump nominees for the US judiciary—Notre Dame Professor Amy Barrett’s and Brian Buescher, both pilloried by Democratic senators for the crime of being Catholic Americans—have shone light on the clear contempt many leftists have for Christianity in general and Catholicism in particular, it wasn’t until Phillips and the Black Israelites terrorized the Covington boys that many Catholics became aware of the gravity of the situation. However, since this weekend’s dustup at the March for Life and the attendant media frenzy, it is now clear that there is an ethno-religious war being waged on Catholics in America. This real fight here has little to do with Nathan Phillips, per se, who is, at heart, simply a stolen valor conman. On the other hand, Philips has a long history of being in the right place at the right time for a media splash. He was present at the Standing Rock Dakota Pipeline protests, which originally began as an organic movement by the Sioux people of Standing Rock Reservation but was quickly coopted by faux-hippies, trust-fund social justice warriors, rich-kid drug addicts, and other weirdos, who were on the dole of none other than George Soros. In fact, when many in the Standing Rock community realized that a bunch of rich, white liberals and other outsiders had come to Standing Rock to party and LARP as Indians in front of the camera, they began to demand the fake protestors leave. Phillips, however, seems to love the spotlight and the attention of white liberals and provoking conflict with conservatives. In April of 2015, he claimed to have been harassed by a group of college students dressed as Indians. In his account, Phillips plays the victim of racism and acts as the noble and righteous teacher of social justice. It is difficult to believe this guy, especially since his claims to have been a Vietnam Vet have been debunked and his story about what happened with Covington kids has changed multiple times. Due to his desire to provoke conflict and get media attention, many have suggested that Nathan Phillips is a life-time actor paid by George Soros-esque NGOs to stir up trouble in front of the camera. First of all, as far as we can tell, neither George Soros nor any of his foundations are directly funding Nathan Phillips. Soros has donated to radicalizing Native American causes such as the Native American Voter Alliance and the National Congress of American Indians Fund, but there is no direct evidence of Phillips having been funded by Soros. A foundation created by Phillips, however, does have the backing of powerful people who do not have the Church’s best interest in mind. Phillips’s Native Youth Alliance is funded, as its own website states, by a number of left-wing bigwigs, including Bill and Melinda Gates and, yes, the Rockefellers, of course. It seems as though Mr. Phillips is in the pocket of a different network of leftwing billionaires, who’ve now turned their sights on the Catholic Church. Recently, after the Covington incident, Phillips attempted to interrupt a Novus Ordo Mass at the Shrine of the Immaculate Conception. Moreover, members of the American Indian Movement have begun protesting at Covington Catholic High School in support of Phillips. To many Catholics it seems as though the attacks on the Church by radical billionaires and their coterie of bought-and-paid-for protestors seems planned out and organized. Perhaps that’s because it is. In October of 2016, the hacker cartel Wikileaks began releasing bundles of emails hacked from Clinton campaign organizer and Democratic operative John Podesta. 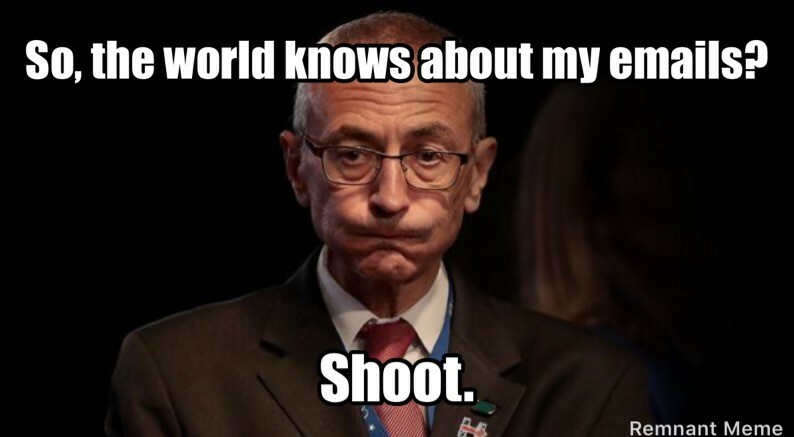 The most famous of these emails, which included bizarre references to food such as pizza, hotdogs, and pasta, were interpreted by many internet researchers to be sexual innuendos and thus the infamous Pizzagate conspiracy was born, suggesting that John Podesta and other members of the Democratic Party were somehow part of a human trafficking operation. It did not help that John Podesta’s brother, Tony Podesta, was corresponding with the notorious witch Marina Abramović—here is one of the least disturbing photos of her—about attending a “Spirit Cooking Dinner,” which is a grotesque ritual that most immediately derives from the spell book of the Satanist Aleister Crowley, but is, in fact, an ancient gnostic and hermetic ritual. What is most interesting about these emails is the response the leftwing press has given to them. No one has denied that these emails are from Podesta and his circle; rather, the most common response has been one of anger, that the emails were hacked, followed by the complaint that this information is none of the business of the hoi polloi out there. More relevant to Catholics is a discussion from February of 2012 in which John Podesta corresponds with Sandy Newman of Voices for Progress about affecting a potential “Catholic Spring” in the Church. Angered by the US Catholic Bishops’ opposition to contraceptive coverage in the Obamacare package, Newman, who is not Catholic, writes to Mr. “Spirit Cooking” himself, John Podesta, that there “needs to be a Catholic Spring, in which Catholics themselves demand the end of a middle ages dictatorship and the beginning of a little democracy and respect for gender equality in the Catholic church.” After mentioning how the “economic power of the Church” can be used to put dissident priests and nuns in line, Miss Newman further muses on “how one would ‘plant the seeds of the revolution,’ or who would plant them” to bring about this Spring.